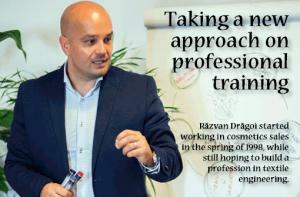 Răzvan Drăgoi started working in cosmetics sales in the spring of 1998, while still hoping to build a profession in textile engineering. Several jobs and years later, he joined FAN Courier’s management team. He stayed with the company for 13 years, which allowed him to learn key lessons in entrepreneurship. With that experience under his belt, he opened his own business, The Trainers, two years ago. The business aims at developing a platform where companies and training experts can meet. In the spring of 1998, Răzvan Drăgoi began his professional career as a salesperson for Avon Cosmetics. He soon moved to Iași where he embarked on studying to become a textile engineer. But new opportunities were never far from his thoughts and soon he was given the chance to work as a sales coordinator and build his own sales team. It was a sudden development, but someone believed in his abilities even though he was only 19. And he felt at home at the helm of a team of 32 sales representatives. ”Later, I accepted the role of sales manager with the same company, which believed in me without hesitation from day one. By now, I had tasted professional success and I wanted more already. I have always felt that good opportunities cannot be shunned, so after a brief discussion with Felix Pătrășcanu, (FAN Courier co-founder) I joined FAN Courier’s management team,” he told Business Arena. In nearly 13 years with the company, Răzvan Drăgoi developed three major projects: the implementation of a regional management system for franchisees, he created and developed the company’s training department and worked on a strategic management project. He believes that his stint with FAN Courier allowed him to learn valuable lessons about entrepreneurship, and thus he eventually decided to start his own company. “Two years ago, I felt a change was needed in the training market. I knew the market needed a new direction that could benefit both trainers and companies. So, I had two options: the first would have involved the creation of a training company offering the same general services as most others. Highlights from previous issues of Business Arena's print edition.